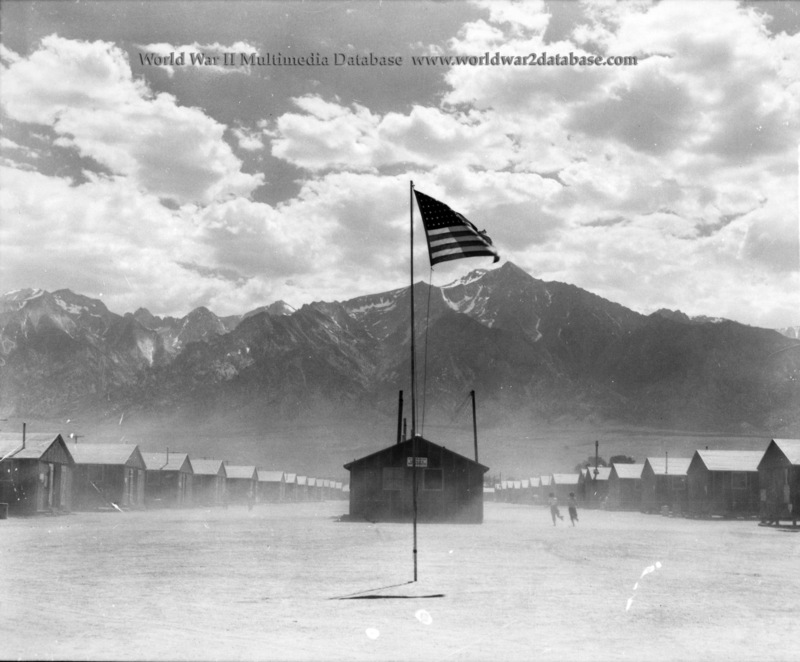 Two Japanese American internees run for shelter during a dust storm at Manzanar War Relocation Center. The heat, wings, and grit peeled away the tarpaper walls and sand got into everything at the camp. Dorothea Lange worked from February to July 1942 documenting the forced internment ostensibly for the War Relocation Authority (WRA). She was horrified by the internment and the conditions the Japanese Americans were forced into. She used her position as a photographer to portray the internment accurately, which the War Relocation Authority disapproved. She maintained an air of neutrality to circumvent guards and officials that would try to prevent her from photographing the actual experience of the internment. Lange was accused several times of distributing her photos, which were classified during the war. She gave a photograph to Caleb Foote, a leader in the Fellowship of Reconciliation, who used it as the cover of a pamphlet denouncing the internment. The WRA investigated. But luckily for Lange, a congressional investigating committee had published the picture, thus putting it into the public domain. Other accusations were also never proved. All the photos were given to the National Archives and most were never published.